Raúl Colon writes about how the German Luftwaffe came to its end in the final months of the second World War. The final came swiftly to the once powerful German Air Force. After nearly two years of continuing fighting on two major fronts, the Luftwaffe, once the most feared air force in the world, was reduced to a token force. The force that once dominated the skies above continental Europe was now in no position to slow down the onslaught of Allied formations pounding the Fatherland. But although the writing could be clearly seen from the outside, it took a long time for the Luftwaffe leaders to realize their dire situation. In fact, it was not until the beginning of April 1945 that the “end of the war” was clearly seen. By this time, allied ground forces were rapidly approaching the German capital, Berlin, from the West. This quick advance by the powerful armies of the Western democracies besides taking huge chunks of German territory, it had also overrun a good portion of Germany’s aircraft factories. 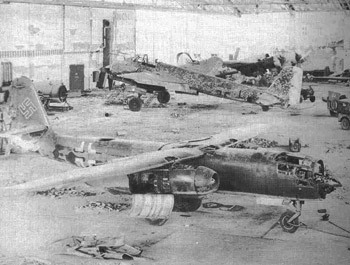 For example, the Focke Wulf factory at Cottbus, which had just begun to mass produce the Ta-152 high altitude fighter, when it was overrun by the Red Army. Full production of the Ta-152, along with its “wonder weapons” counterparts, the Ba-349, He-162 and Do-335; came to a crashing halt by mid March 1945. By April 1st, Gruppen Jagdheshwader 1 had received nearly its full He-162 complement. The pilots on the outfit found the new fighter to be extremely fast and maneuverable although very unforgiving. Almost two hundred of these jet fighters were delivered to the Luftwaffe before hostilities ceased in May. The Bachem Ba-349 Natter vertical take off interceptor was another of the Luftwaffe’s wonder weapons. The platform passed the manned test flight phase without much glitch and by April 1945, units of these small planes were already deployed. The first fully operational Ba-349 launching site was located at Kircheim near Stuttgart. The aircraft never attacked the dreaded US 8th Air Force bomber formations they were designed to do from Kircheim. The Germans, fearful that their new weapon would slid into American hands, demolished the aircraft’s take off ramps as the American Army was closing the Stuttgart gap quickly. As for the other wonder weapon, the much heralded Dornier Do-335, the aircraft ran into many technical hurdles during its design phase, and although they were corrected, this twin engine fighter never entered operational service. At the same time the Germans were abandoning air force bases, the much malign Luftwaffe was launching their last great offensive. Operation “Wehrwolf”, the planned large ramming operation against the American heavy bomber formations, took place on April 7th. A force of 120 Bf-109 and 59 Me-262s were thrown against an American air fleet of nearly 1,300 B-17 and B-24 bombers, supported by a massive fighter complement. Utilizing fewer aircraft than the operational plans called for, “Wehrwolf” was a failure. 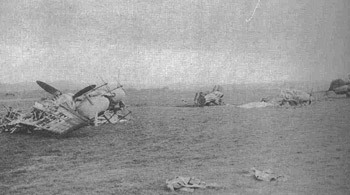 Only eight heavy bombers were lost due to the new German ramming technique, fifteen were damaged but were able to return to their departing bases. In all, the American shot down 59 German planes. There was widespread recrimination inside the Luftwaffe for the apparent failure. Evidence collected pointed to icing conditions preventing most German fighters to reach their dive positions and the fact that the Germans mounted an operation this complex without the required complements of aircraft. Whatever the reason for the failure, the fact remains that after “Wehrwolf” the Luftwaffe ceased to plan any other large scale operation due to its shortness in assets and now time. By the second week of April, the German forces, fighting on two fronts; only controlled two separate enclaves in the country, the Bavaria sector in the south and the area around Schleswig-Holstein in the north. In recognition of this development, the Luftwaffe command was restructured once more. The still operational units in the north of Germany, East Prussia, Denmark, Norway and Courland were placed under the command of Luftflotte Reich under General Stumpff. 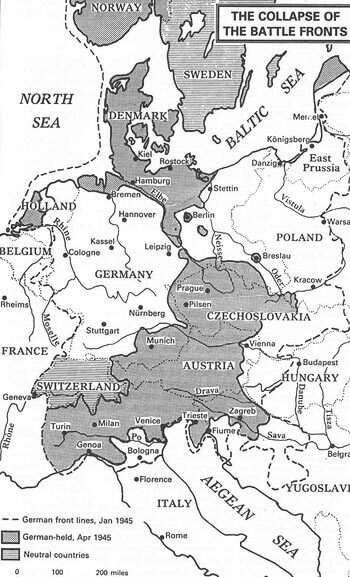 The units in the south of Germany, Hungary, Czechoslovakia and northern Italy were placed under Luftflotte 6 under the overall command of General von Greim. On the ground, by April 16th, Soviet spearheads were crossing the Rivers Oder and Neisse and began to establish beachheads on the other side. The German formations on the rivers’ banks, outnumbered two to one in manpower and four to one in equipment, fought valiantly and initially they held them back. That afternoon, every Luftwaffe unit available for combat operation was thrown into the desperate battle. The attack action that took place by the gallant Luftwaffe pilots can only be described as desperation. In a classic kamikaze-style attack, scores of Bf-109 pilots rammed their aircraft against Soviet tanks pouring into the new established beachhead. This was the first and only occasion that the Luftwaffe would employ this barbaric tactic in combat. No one knows the extent of the damage caused by the Luftwaffe’s kamikaze pilots. If it was significant, Soviet engineers were quickly able to replace the damaged pontoon bridges. In fact, the flow of Soviet troops and equipment continued almost un-molested by the air attack. By the late 17th, scores of Soviet bombers augmented by a massive artillery bombardment stunned the outmanned defenders. By the early hours of the 18th, the mass of the Soviet Army was preparing to cross the rivers. German defense positions along the rivers banks crumbled in the face of superior numbers and firepower. At the same time inside Adolf Hitler’s Berlin bunker, the situation was reaching a climax. Hitler began to issue orders to many depleted Luftwaffe combat units to attack the Soviet formations at once. One order in particular stunned General Karl Koller, the Luftwaffe Chief of Staff who had been by the side of the German leader in his bunker. Hitler proposed to give the command of all jet fighter and bombers to Hans Ulrich Rudel, a ground attack expert who knew little about the new jet planes. Koller and other Luftwaffe officials tried to talk Hitler out of the idea. The situation deteriorated further when on the morning of April 21st Berlin was shelled by Soviet long range artillery. Hitler was furious. He demanded from Koller an explanation regarding the Luftwaffe’s absentee from the fight during that morning barrage. Koller tried once again to tell Hitler the fact that most Luftwaffe units were depleted and the ones that remained semi operational lacked sufficient fuel and ammunition to mount an effective campaign. The Fuhrer criticized the fact that the Me-262s did not take off from their field in Prague to support the beleaguer Berlin garrison on April 22nd. Koller responded that in spite of the continually narrowing and changing combat area, the Luftwaffe was encircled in ever smaller pockets, surrounded on all sides by a much stronger foe; all that is humanely possible to relief Berlin is being done. By the late hours of the 22nd, Hitler began to see the writing on the wall. He finally came to the conclusion that the war had been lost. Many of Hitler’s inner circles tried to convince the Fuhrer to leave the capital but he refused. Instead, Hitler had his secretaries bring his personal papers up to the bunker’s courtyard and burn them. The Wehrmacht wanted to take all of the troops fighting on the West and throw them in the East. Meanwhile, Reichmarschall Hermann Goering, who was first in Germany’s line of succession, began to carve out a plan to take command of the Third Reich. He seized the opportunity and, before all communication was lost with the Berlin bunker, on April 23rd he sent a cable directly to Hitler. In the now infamous telegram, Goering stated his reason for taking command of the Reich. He cited the Fuhrer’s decision to remain in Berlin despite all odds and courted Hitler’s June 29th, 1941 decree stating that if the Fuhrer is incapacitated in any form, the Reichmarschall would take over the German government as its official head. Goering even demanded that Hitler respond to the cable before 10:00PM of that day. He sent the same piece to Keitel and Ribbentrop. Before Goering’s telegram arrived, the Fuhrer had recovered his sense of purpose and began planning the capital defense. When he received the cable, Hitler went on one of his now famous tirades. He lambasted Goering calling him a traitor. Enraged by what he saw as a stab in the back from a trusted old friend, the German leader sent Goering a strongly worded cablegram forbidding the Luftwaffe leader from taking over the government. The Fuhrer sent out orders to arrest Goering at once, together with Koller and many top Luftwaffe officials. Thus, at the time of its greatest peril, the Luftwaffe was left without its top officials. After the arrest of all of the officials, Hitler released Koller the same day, the Fuhrer appointed General Robert von Greim, previously commander of the Luftflotte 6, to the post of Commander in Chief of the Luftwaffe replacing Goring. As all these were happening, the disintegration of the Third Reich continued at a rapid pace. On the afternoon of the 25th, the two arms of the Red Army met west of the German capital. On the same date, Soviet and American spearheads linked up on the River Elbe at Torgau. With this linking, the only way available for the German Army to move its forces and equipment was by air. Night flights became the sole mean of transportation for the once fearful German Army. Meanwhile, the Luftwaffe continued its desperate attacks against the Soviet columns crossing the River Oder. On the afternoon of the 27th a force of seven Mistel and three Ju-188s, joined by a force of Fw-190 fighters; attacked the Soviet Oder’s beachhead. As they approached the target area, a massive anti-aircraft barrage greeted them. It was a slaughter. In the end, only one of the seven Mistel returned along with a sole Fw-190. As these sorties were taking place there were a frantic effort to supply the beleaguer Berlin garrison. A flight of six Fieseler Storch, escorted by 30 fighters assembled at Rechlin to fly to the German capital at dusk. The operation failed miserable. Terrible weather was blamed for the failure. On the 28th, four Ju-52 left Rechlin bound for the center of Berlin. Only one Ju-52 made it through the flak-heavy encirclement. On the 29th, von Greim flew to Rechlin to plan the air aspect of the Fuhrer’s “massive attack” on the Soviet army in the Berlin area of operation. Unfortunately for the Fuhrer by this time the Luftwaffe had just a trickle of combat ready units available for the operation. Having changed bases so often in the past year meant that the units allocated to those bases had retired from them without its full fuel compliment as well as its ammunition allocation, thus when Hitler ordered the “massive counter attack” there were no full combat ready Luftwaffe unit available for combat. There was also a major shortness in manpower as well. As the German Army began to crumble, many Luftwaffe units were disbanded. These displaced Luftwaffe personnel went on to join the Army’s ever depleted ranks. The Army was also in peril. Its units decimated by four years of brutal combat. When the attack commenced in April 29th, it smashed itself uselessly against the powerful Soviet force ringing the capital. In Berlin itself, conditions were rapidly deteriorating. Fuel and ammunition had almost run out and the only way to re-supply the small pockets of defenders that now fought for every corner of the city was with airdrops. A prospect that now the once most powerful air force in the world could not even attempt to perform at this time. On April 30th, Hitler named Grossadmiral Karl Donitz his successor as Fuhrer of the Third Reich; he then proceeded to commit suicide. From the moment Donitz assumed command of the German state, he worked to end the war as soon as possible. He understood the need to at least slow the Soviet advance so as much as possible of the German civilian population could make it to areas controlled by the Western Allies. As soon as he commenced surrender negotiations with the American and British, masses of German ground, naval and air formations began to surrender in full. Almost all of the Luftwaffe forces who were able to surrender to the Western Allies were content to do so. But in the east the situation was different. Several units continued to resist the Soviets with ferocity. The units that were closer to the Allies’ lines began to journey into them with as many civilians as they could take. The end came swiftly for the Luftwaffe. An end it was destined to achieve given the nature of the war Hitler undertook. Bekker, Cajus. The Luftwaffe War Diaries, John Macdonald & Co., London, UK, 1966. Young, Richard A. The Flying Bomb, Ian Allan Ltd., Shepperton, UK, 1978.